The Cruising Fleet is a group of sailors who promote the racing of keelboats, multihulls and dinghies on Cayuga Lake. The fleet has events scheduled most Sunday afternoons during the season. The Cruising Fleet also hosts the annual "Red Jacket Race", a 20-mile race to a dinner at the Red Jacket Yacht Club on the North end of the lake. The Laser is an Olympic class sailboat sailed competitively across the globe. She is a single-handed boat, simple enough to make it a great boat to learn on, yet with performance to satisfy experienced racers. Every Laser in the World is identical. Strict One-Design class rules ensures that remains true, making it the sailor that wins the race, not the boat. She comes in three sail rig configurations to match a sailor’s size and weight: Standard, 76 sqft, Radial, 61sqft and the 4.7, 51 sqft. The IYC is a member of the North American Laser Class Association, District 9. The IYC hosts District 9 events and traditionally sends Laser sailors to local, regional and international events. More informal Laser sailing occurs on Sunday mornings from the IYC beginning in April lasting until late December. The Lightning is a sloop rigged sailing dinghy originally designed by Olin Stephens of Sparkman & Stephens in 1938 and was first sailed on Skaneateles Lake, Skaneateles, NY, USA. More than 15,000 Lightnings have been built since then. There are over 500 fleets of Lightnings worldwide, many of which participate in dinghy racing. There is room in the cockpit for four to daysail, but a crew of three is employed when racing. Ithaca represents Fleet 484 of the Central New York Lightning District. The IYC hosts annual Lightning regattas and sends sailors to many regional and national events. 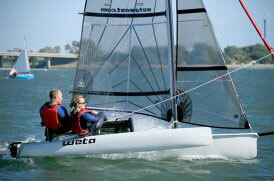 Winner of the "Boat of the Year" Award by Sailing World magazine for 2010, The Weta looks and performs like a high-performance race boat. But the it is also stable, forgiving and easy to sail. Advanced sailors appreciate the trimaran's performance and with the easy set up, people that don't normally have the patience will find themselves grinning ear-to-ear on a 15 knot reach. Ithaca Yacht Club is one of the first clubs in the US to have an established fleet of these hot new one-design dinghies. The first Weta North American Championship was held in April 2013, and sailors from Ithaca did well, finishing 1st, 5th and 7th in a fleet of 18 boats.